I've owned several road bikes over the years. I rode thousands of miles and participated in amateur racing (all--in my youth). I had stopped riding until recently. I bought a new Pinarello road bike to get back into cycling. In recent years I have enjoyed watching the Tour de France which has been broadcast live each year for the duration- twenty one consecutive mornings. Despite the doping accusations that have plagued cycling and the resulting downfall of Lance Armstrong, I haven't lost interest. Cycling is a great sport and this is probably the hardest athletic event in the world. The backdrop of the French landscape, countryside and mountains, figures prominently into this spectacle which just finished for the one hundredth time on July 21 in grand style, in Paris. This year the riders rode 3,404 kilometers. Some very good friends, who happen to be BIG fans of the Tour de France, invited me to join them on a motoring trip following the riders and route of the 2013 Tour. I met up midway through their itinerary in Tours, France in time to see the finish of Stage 12. The morning of Stage 13, Tours to Saint-Amand-Montrond, the Bicycling magazine crew was having a breakfast strategy meeting in the small dining area of our hotel! Our strategy for the day was to catch some swag from the Caravan and walk around the pre-race staging area in Tours where each team's bus, bikes and support vehicles were on display. I took a lot of pictures of bikes but my favorite shot that day was of a rider who stopped to give young fans his autograph. Later we watched the slow roll out of the start of the stage. Team Cannondale bikes. #11 Peter Sagan- Winner of Green Jersey. On Bastile day, July 14, Stage 14, we parked the car in the field of a vineyard and walked a few kilometers uphill to the Col de Madeleine where we picnicked as we waited for the riders. It is about 28 kilometers from the finish on Mount Ventoux. After the racers sped by, we were able to watch the finish on a computer in the woods, powered by a car battery and a satellite dish! We met fans from Australia, New Zealand and the US. on battery powered computer via dish! Vive le Tour! Aside from the race, there was time to enjoy the French countryside and culture. In Lyon we sampled local cheese and fruit. We stayed at an amazing Chateau in Rosans. Our host, Marcel van der Hulst was incredible. 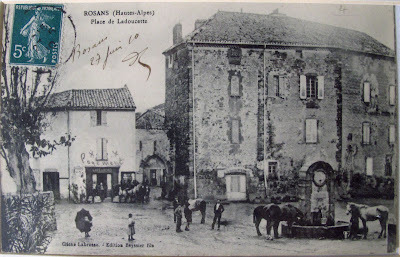 Old Postcard of Chateau Rosans. We took the TGV back to Paris in time to spend a few days and see the finish. Riders enter on Pont de Carrousel, Paris. As a spectator you hear the helicopters in the distance while you wait. Then the lead out Grenardiers on motorcyles plus a few Official cars come speeding by. Suddenly, the riders pop into view for seconds as they fly by. (Video) Listen for the sound of the crowd clapping and cheering as the riders enter the bridge. On the ground is way different from seeing the Helicopter footage! !